Just hours before GOP candidates were poised to take the stage for Wednesday night's third Republican primary debate, Democratic hopeful Bernie Sanders made an announcement of his own. 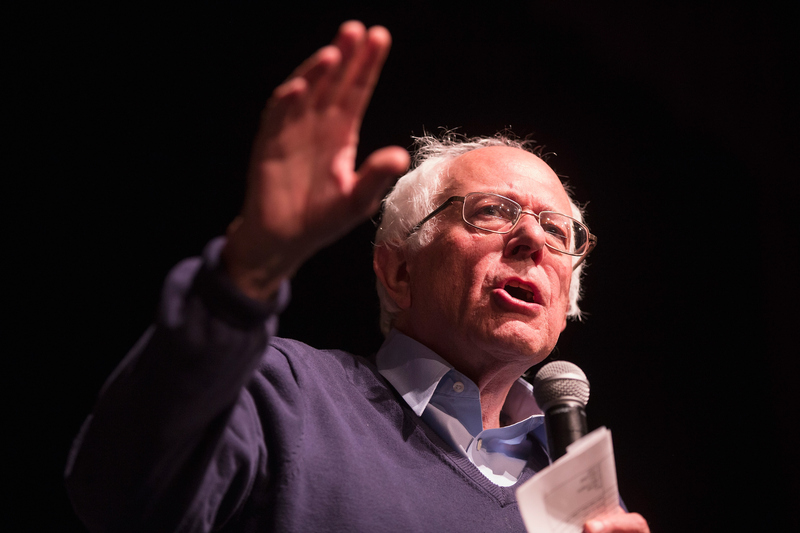 According to The Washington Post, Sanders shared his support for legalizing marijuana by dropping it from the federal list of most dangerous drugs. By doing so, it would essentially afford states the freedom to legalize weed on their own, without interference from the federal government. Sanders was reportedly at a town hall meeting today at George Mason University in Fairfax, Virginia, when he shared his proposal with a crowd of students. Thanks to the university's Internet broadcast, Sanders' announcement quickly swept Twitter, dominating the conversation almost more than all the GOP debate talk. "The time is long overdue for us to remove the federal prohibition on marijuana," Sanders said while facing the crowd at George Mason University in Virginia. "In my view, states should have the right to regulate marijuana the same way that state and local laws now govern sales of alcohol and tobacco." The news itself is, of course huge. For one, it's impossible not to notice how interestingly timed it was, coming right before conservatives — who are notoriously against legalizing marijuana — were to take the debate stage. But Sanders' announcement is also noteworthy for the fact that it's pretty historic: A presidential candidate has never called for marijuana to be removed from the Drug Enforcement Administration's list of controlled substances. Still, perhaps it shouldn't come as a complete shock: The Vermont senator has actually dropped some hints for a while now about having more to say on the marijuana. Sanders is also not the only Democratic candidate to express thoughts about decriminalizing the drug. His fellow candidate Martin O'Malley has also suggested lowering marijuana to a Schedule 2 drug, while Hillary Clinton has shared that she'd be interested in seeing how states who have legalized the drug (including Washington and Colorado) handle things before the whole country follows suit. When it comes down to it, one of the many reasons why Sanders feels so strongly about legalizing marijuana is the sheer number of arrests and DEA raids that go hand-in-hand with the substance remaining illegal. "In 2014 ... there were 620,000 arrests for marijuana possession. That's one arrest every minute," Sanders told the crowd. "Too many Americans have seen their lives destroyed because they have criminal records as a result of marijuana use. That is wrong. That has got to change." Now more than ever, it seems, that change could be possible. But would it pass in Congress? Considering recent bills aiming to lower marijuana from Schedule 1 to Schedule 2 have failed, it's unclear as to just how soon that might happen.